Tennessee Fishing licenses go on sale February 18 each year and are valid through the last day of February of the following year. You can purchase most fishing licenses from county clerks, sporting goods stores, hardware stores, boat docks, the Tennessee Wildlife Resource Agency web site and all TWRA regional offices. Online: Log on to www.tnwildlife.org and click on the link, “Buy a license online.” Regular license fees plus a processing fee will be charged to your credit card. Processing fee is $3.00 if you print it, or $4.25 if it is mailed to you. By phone: Call 1-888-814-8972. An authorization number will allow you to begin fishing or hunting the minute you hang up. Regular license fees plus a processing fee will be charged to your credit card. Processing fee is $6.25, or $7.50 if license needs to be mailed to you. US mail: Send your name, address (including zip code), social security number, date of birth, physical features (height, weight, eye and hair color), and enclose the correct fee to: TWRA Sales Office, P.O. Box 41729, Nashville, TN 37204-1729. See Tennessee Fishing Regulations for Fort Loudoun Lake. 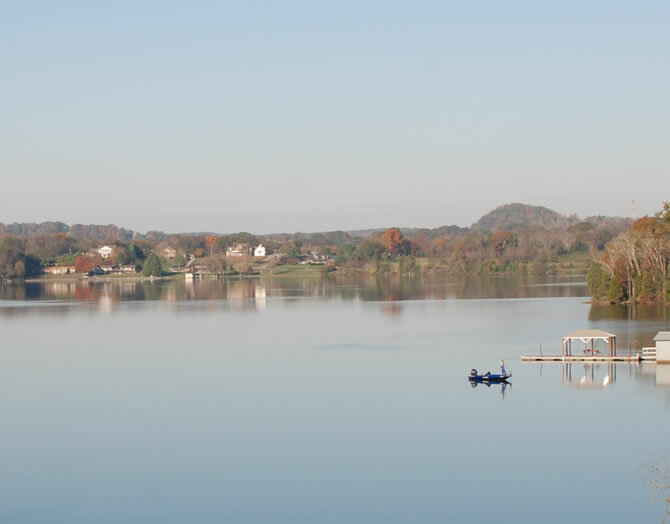 Loudoun Lake is connected via canal to Tellico on a 14,600 acre reservoir and is a much different lake. The warm water reservoir is more fertile and has more forage allowing bass to grow better. June and May tend to be the best months. Look for overhanging bushes, undercut points, banks and islands. If the water's up and touching bushes this tends to produce the best bites. Here are some great fishing tips provided by TWRA (Tennessee Wildlife Resources Agency). Be sure to download the Fishing Guide for Tennessee Fish. Vertical jigging a leadhead tipped with a minnow in submerged tree tops is a good choice for catching crappie clinging to structure. Trolling medium diving crankbaits in 12 to 18 feet of water is a good way to find suspended crappies. Turkey Creek is a great place to troll for suspended crappie. Chartreuse grubs in 1/16 to 1/4 oz. size are doing very well right now. White and silver grubs are doing well also. The lead head tipped with minnow is catching good numbers of crappie. Smaller, slower presentations such as tubes and jigs are catching a few bass, but most are in the 1 to 1.5-lb. range. Spinnerbaits and minnow imitating crankbaits are still catching a few, but sometimes bites are few and far between. They prefer small live bait such as crickets, redworms, pieces of nightcrawlers and even small artificial lures like grubs and very small crankbaits. A slip bobber set up is a good way to find some bigger bluegills, when they are a little deeper. But right now, you can find them anywhere on the reservoir. Submerged timber and brush are the best places to find these tasty panfish. Bluegill are excellent fighters when caught on a flyrod with a popping bug. Nightcrawlers and chicken liver seem to be the top bait choices for small to medium sized cats and cut bait seems to be the best bait for the bigger cats. Cut bait mainly consists of a shad or other oily baitfish cut into pieces and placed on a fairly big hook with a sinker from about 1/2 to 1 1/2 ounces. It is best to have heavier rods and reels for the bigger cats because they can pull very hard once hooked. They have even been known to pull entire fishing poles from the hands of anglers on occasion. Catfish primarily range from 1 or 2 pounds up to and including some in the 50-60 lb. range and everything in between. You can catch them during daylight hours right now, and big flat areas seem to be the hottest spots. The waters of Tennessee offer opportunities for anglers of all ages. Use this free anglers guide provided by the Tennessee Wildlife Resource Agency (TWRA).